Carson City, Nev., Feb. 11, 2019 /PRNewswire/ -- Spirit levels were used to build our country. As good as they are bubble vial levels are off in extreme temperatures, lose their bubble integrity over time and can be hard to see. 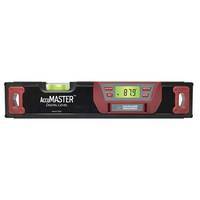 All these issues are addressed with Calculated Industries' two new AccuMASTER digital levels. Check out both levels at the International Builders Show February 19-21 in Las Vegas. Warped wood or twisted composite frame levels with evaporated alcohol filled vials make many spirit levels out of level. However AccuMASTER's new digital levels, the AccuMaster Level and the AccuMaster Pro Level both address these issues with their sturdy milled aluminum frames that are built to last. Plus, their bottom rails have powerful magnets built in for steady measuring on metal pipes and conduit. Their digital displays accurately show plumb and level as well as pitch and slope (in percent or degree). The displays also invert when using the levels upside down for easy reading. Both levels' displays can be "locked" to allow the units to move for easier reading. Further they provide accurate measurements within ±0.2° in extreme weather conditions. The AccuMASTER Level includes a bubble vial for level and the AccuMaster Pro Level has two bubble vials for level and plumb. The digital displays show the angle of the surface with an arrow indicating if the surface should move "up" or "down" to obtain the desired level. An optional beep sounds at 0° and 90°, if the audible function is turned on. "Being able to depend on your level is critical in building quality projects. Plumb and level are the basis of building and knowing the angle is within two-tenths of a degree can help you build with pride," said Steve Kennedy, President of Calculated Industries. "Using a level you can count on is just as important as the skills you bring to the job." The levels display pitch in inches of rise per foot. Slope is displayed in percentage or degree on the bright digital displays so you can see it in any light condition. AccuMaster Pro Level also displays in Metric. Further, you can get the true level of a work surface using the levels' absolute angle function. You can also find the relative angle between two work surfaces. Calculated Industries is one of the country's leading manufacturers of specialty calculators, apps, digital measuring tools, and precision hand tools for industry and personal use.